Most of us enjoy a good burger, whether the more traditional beef or turkey, the more unusual bison or wild boar, or even the fish burger. And let’s not forget that some of us also enjoy a tasty vegetarian or vegan burger. Whatever your burger preference; using a burger press will help it taste even better when you have not had to spend hours in the kitchen kneading and shaping patties. Using a burger press means that a batch of burgers not only look consistent but also that they cook consistently – important to help prevent foodborne illness. 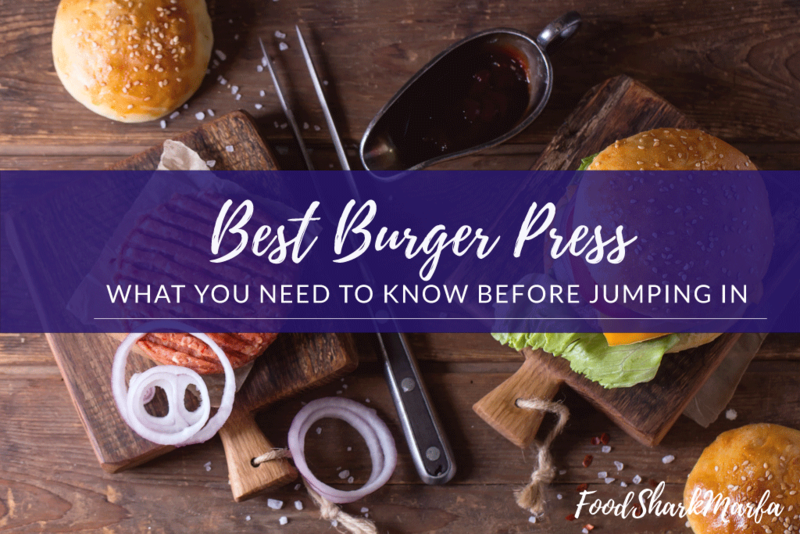 As it can be difficult to find the best burger press with the variety of products available, this review will take look at some of the current presses to see what they offer. The clear heavy duty winner is the adjustable Weston Non-Stick Single Hamburger Press. Is the competitively priced Cuisinart CSBP-100 3-in-1 Stuffed Burger Press for making stuffed burgers, traditional burgers and sliders. 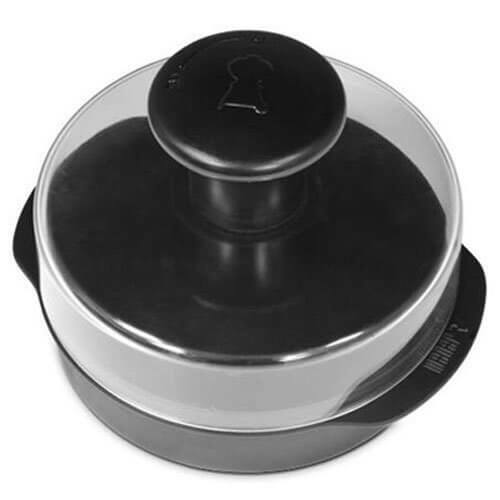 Made of non-stick heavy duty aluminum, the Weston Non-Stick Single Hamburger Press offers a patty diameter of 4½“ and an adjustable thickness of up to 1½“. The Weston has a spring plunger that allows you to remove the completed patty and it is predrilled for fastening onto your worksurface or a separate board. Complete with a one-year warranty, this press is designed for easy wipe cleaning and replacement sheets for the patties are available in packs of 500 or 1000. You may find it helpful to use patty sheets top and bottom when pressing as it stops any meat from squeezing into the gap around the top of the press. You may also want to ensure that the top plate is adjusted properly and locked into place to ensure that patties are of a consistent thickness across. 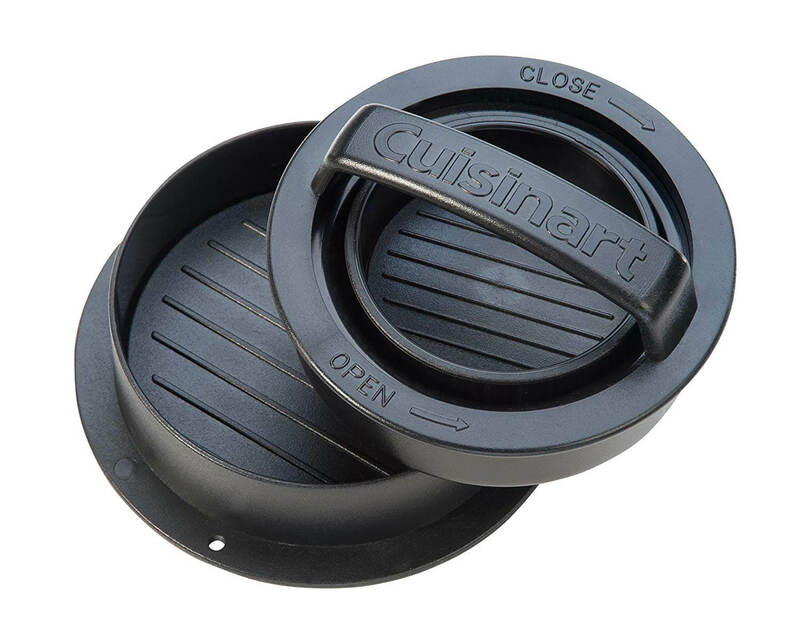 The Cuisinart CSBP-100 3-in-1 Stuffed Burger Press is designed for not just stuffed burgers but also sliders and traditional burgers. The base of the press is loaded with patty meat and then press one is used to compress the meat and leave an indentation in it. You then add your stuffing, more patty meat on top and then use the flat press and push up from the bottom to remove the stuffed burger. However, some experimentation may be needed around quantities depending on type of ground meat and filling. Some may also find the diameter of the press a little small compared with other types of press. The CSBP-100 has a non-stick coating, comes apart for cleaning and is also dishwasher safe. Patty papers can also be used in this press. The heavy duty Bellemain Premium Burger Press allows you to produce 4½“ diameter burgers with variable thickness from ¼” to 1½“. Its spring-loaded mechanism allows for easy release and although this product is not dishwasher safe, it can be dismantled for thorough cleaning. You may find that patties are more consistent if the ground meat is weighed and added in one loose ball to the press, rather than multiple scoops. Where the scoops meet in the press the patty can be weaker formed which means it can increase the chance of the patty breaking when put onto the grill. This press is suitable for mounting onto a worksurface or board and patty papers can be used. 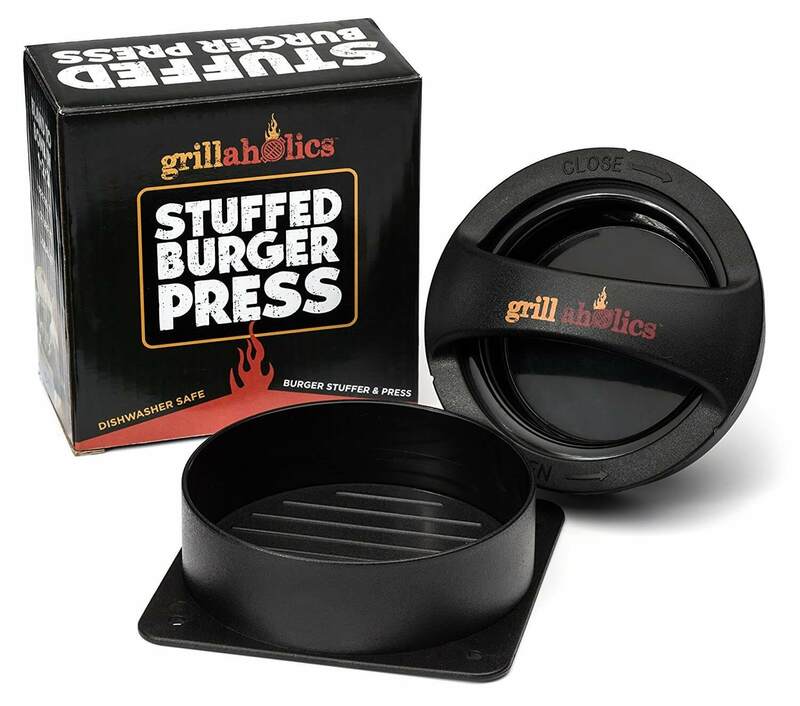 Dishwasher safe and made from BPA-Free non-stick plastic, the Grillaholics Stuffed Burger Press makes ½lb stuffed burgers or burgers. There is a three-step process of ‘Press It, Stuff It and Seal It’ to produce stuffed burgers. The patties are release by pushing up the base of the press. Depending on the type of patty being made, either using a patty paper or a little oil on the base may stop the patty from sticking. The printed instructions may not be the easiest to follow but there are instructions and videos available online. The Grillaholics press also comes with a lifetime guarantee and a Stuffed Burger Recipe eBook. 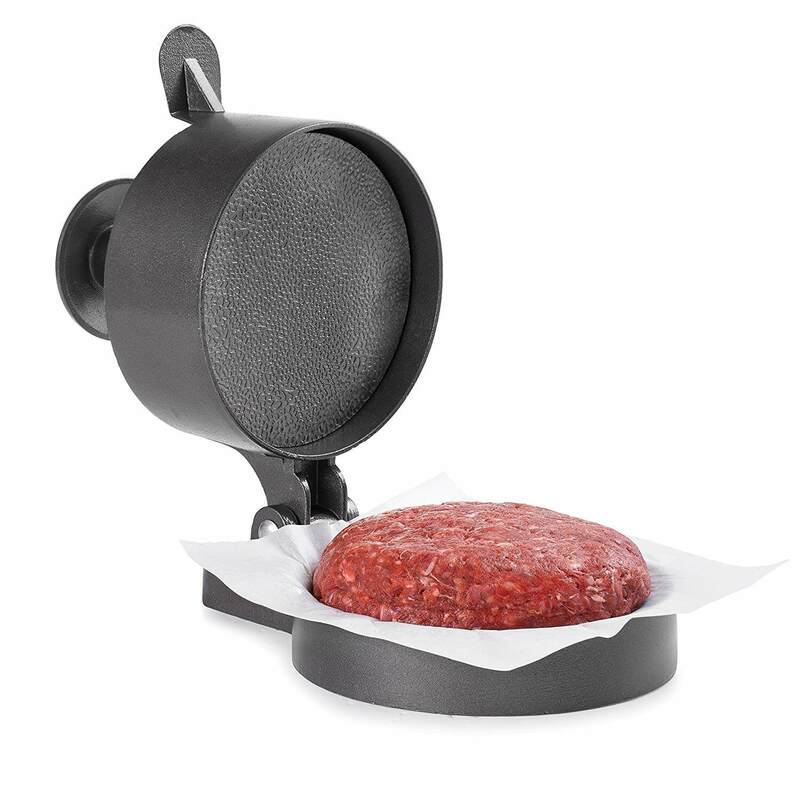 Offering a choice of either ¼lb or ½lb burgers, the Weber 6483 Original Burger Press forms patties with a dimple designed to help prevent puffing in the middle of the burgers during cooking. The also comes with a two-year limited warranty and the handle can be removed for easier storage. It can also be dismantled for easier cleaning. Although not explicitly packaged as being dishwasher safe, with its plastic components, some users may choose to clean it in the dishwasher, although be aware that this may affect its warranty. It may be helpful to use patty papers or plastic wrap when pressing to ensure that patties do not stick. The GWHOLE Burger Press is a heavy duty press made of strong food grade aluminum and offers various weight patties of around 4¼“ diameter. Safe for cleaning in the dishwasher, the GWHOLE comes with 100 patty papers and the manufacturer recommends that you always use papers for ease of burger release once pressed. This press is also suitable for using on the grill directly as a roast plate and the handle of the press can be removed for easy storage. 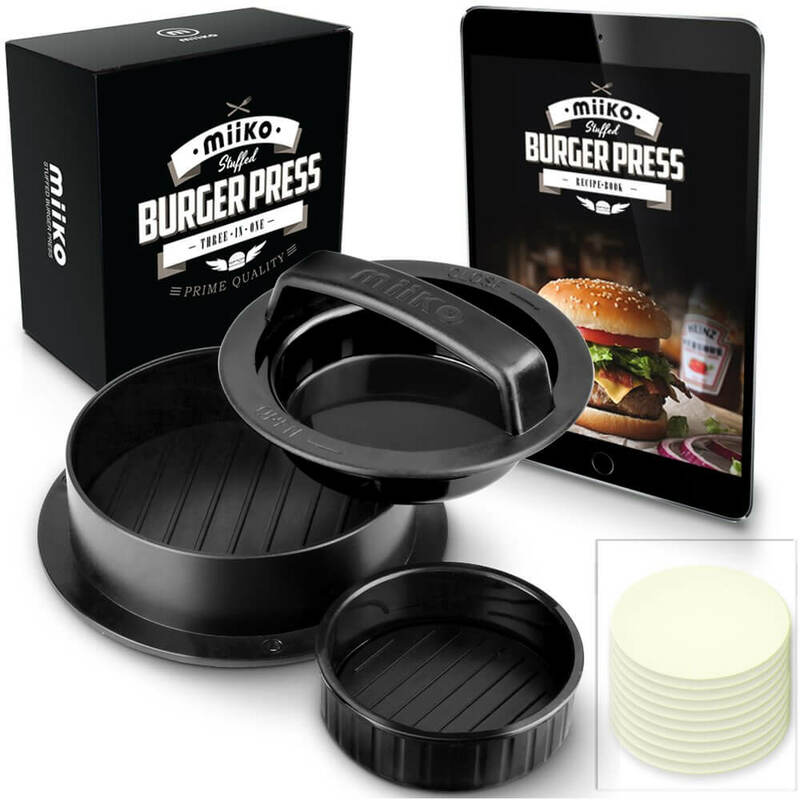 A three-in-one press, the MiiKO Stuffed Burger Press is designed for making burgers, stuffed burgers and sliders. Made from plastic, it offers easy cleaning and is dishwasher safe. 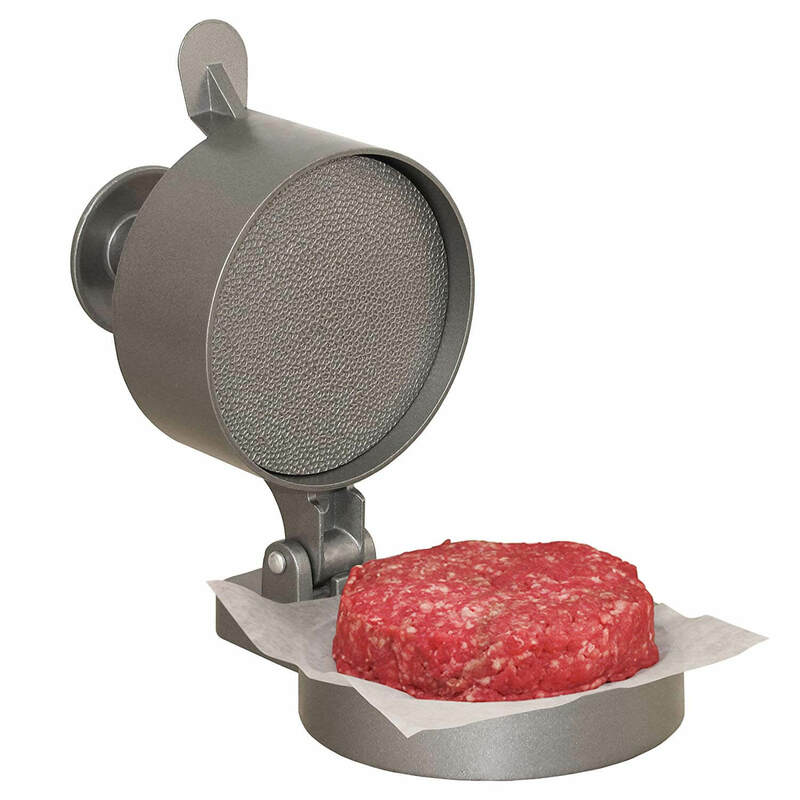 Its design offers burgers as either 2½“ or 4” diameter and the press is ribbed for easier searing. You may wish to use patty papers to prevent your burgers from sticking. The instructions may not be as useful as they could be, although the MiiKO press does come with a recipe eBook. The Stuffed Burger Press is a three-in-one model, allowing you to make stuffed burgers, sliders and regular burgers. It has ribbing inside the press which helps give the seared look to cooked burgers. Some patty papers are provided with the press and it is recommended that you do use papers to make it easier to release the burgers from the press. Burgers can be made from almost anything, although the main ingredients are usually meat, fish or lentils. Unlike store-bought burgers, when you make your own, you know exactly what ingredients go into them. This also means you can make them to meet many dietary requirements such as lower fat, gluten or dairy free or even low sodium. Making burgers by hand can be labor intensive, especially if you have a lot to make. There can be big inconsistencies in shape and/or thickness which means that cooking times can vary quite a bit between burgers. Although some presses only have one burger diameter and/or set burger thicknesses there are also products that offer variable thicknesses and may have more than one diameter. Which type is best for you will often depend upon who is making (and eating) the burgers. Using a press can be a more hygienic way of handling meat and if patty papers or plastic wrap is used it is possible to make the mix, press it and place the burgers onto the grill or into storage without touching them with your hands. If you make patties by hand it means kneading to get the patty into shape which allows more liquid to be lost from the meat before cooking whereas when you use a press you put your ground meat straight into the press to be pressed and shaped in just movement. The minimal handling helps retain liquid in the burger. 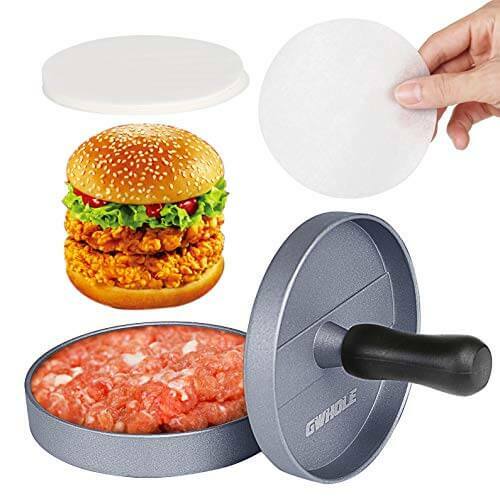 Burger presses can also be useful for making sausage patties and crab cakes and some presses are suitable for making stuffed burgers or sliders. Instructions are usually provided with the products and many manufacturers offer further info, recipes and tips on their websites. Whichever press you decide to use, there are a couple of basic principles that apply to them all. One is to always make sure that the surface on which the press is to be placed is flat and that the feet of the press – if it has them - are adjusted to ensure they are level. The second is that you may need to occasionally lubricate any moving parts of the press with food grade oil, particularly if you have purchased a heavy duty metal press. When making burgers, like with any type of food prep, we should always wash our hands and surfaces frequently. The USDA Food Safety and Inspection Service (FSIS) recommends that we wash with soap and warm water for 20 seconds after handling ground beef and keep raw products and utensils used for raw products away from any cooked items to prevent cross-contamination. Burger presses can usually be fully dismantled so that they can be cleaned properly. Some presses are totally dishwasher safe, but others may just have parts that are dishwasher safe so it’s always worth checking the manufacturer’s recommendation. If a burger press is unable to be placed in the dishwasher it can be washed by hand or sanitized with one tablespoon of non-scented liquid chlorine bleach per gallon of water. This cleaning solution is also suitable for cleaning utensils and work surfaces. Even if you are planning on cooking your burgers straightaway you should still pop them in the fridge while the grill is heating. Not only does this reduce the risk of potential foodborne illness but keeping them cold helps keep the liquid and fat in the meat once you pop them on the grill. Patty papers are waxed papers in a variety of sizes. You may find it useful to use them when pressing burgers as not only do they stop meat from sticking to the press, but they allow you to stack and part them easily. Patty papers can also be left on burgers heading for the freezer. Parchment paper or plastic wrap can be used like patty papers. Parchment is a greaseproof paper that will stop meat from sticking to the press or burgers from sticking together, as will the plastic wrap. All three of these do the same job with a burger press but patty papers do tend to be available precut to the size of most presses and indeed, some press manufacturers recommend and provide patty papers with their presses. Oil can also be used to grease a burger press to stop meat from sticking but if you do prefer to oil the press, you may need to regularly add oil if you are making a large batch of patties. The minimum safe temperature for ground meat is 160°F or for ground chicken or turkey it is a little higher at 165°F. How long it takes to reach this temperature depends on how thick and what size your burgers are. The easiest way to ensure the safe temperature is reached is by using a food thermometer during cooking. The USDA recommends that ground beef is always cooked to an internal temperature of 160°F. This is the minimum temperature required to kill the strain of bacteria E. coli O157:H7. This strain of E. coli can survive freezing and it produces a toxin that can cause hemorrhagic colitis. This can develop into hemolytic uremic syndrome, a very serious condition that can cause strokes, brain damage, seizures and kidney failure in the young and the elderly. E. coli O157:H7 has been linked to undercooked ground beef and has been responsible for various outbreaks of foodborne illnesses and deaths. Although we do have preferences as to how well done or rare we like our burgers, unfortunately the only safe way to kill any E. coli present in ground beef is by cooking it to 160°F as measured with a thermometer. Although many of us prefer meat with fat content of around 15% to 20% when making burgers, choosing leaner cuts of meat for burgers can reduce saturated fat intake which can help to lower the risk of coronary heart disease. Lean meat is defined by the USDA as less than 10 grams of total fat and 4.5 grams or less of saturated fat or extra lean has less than 2 grams of saturated fat and less than 5 grams of total fat. Both types have less than 95 milligrams of cholesterol. The USDA recognizes various cuts of beef that are lean and using one of these cuts will offer a lower fat burger. Lean beef is also a high-quality protein source and contains iron, zinc, vitamin B12, selenium and other essential nutrients. If you are looking to serve up healthier burgers, then it may be appropriate to also go easy on the toppings and the sides; stick with salads and use lower fat dressings. Leaner meat can also be used in stuffed burgers as depending what you stuff them with, the lower fat content of the meat may not be as noticeable. Stuffing a burger with cheese and other ingredients such as jalapenos or mushrooms also means that less cheese is served than if you were to add the cheese to the top of the burger before serving. Using a press can help reduce liquid loss from burgers during cooking. Because protein is interspersed with fat and water-based liquids, as the burger cooks, its tissue network tightens and squeezes out liquid. At the same time, the fat in the burger begins to liquefy so this also squeezes out. There is no way to stop burgers from losing liquid during cooking but whenever a burger is turned or prodded, a little more liquid is lost. This is also the reason why we should try to only flip each burger once during cooking and never press the burger with a spatula to try to speed up the cooking time (unless you are doing smash burgers on a griddle). It may sometimes be helpful to add additional liquid to the mix when making burgers to help increase the amount of juice. Beef, poultry and fish usually shrink around 25% when cooking. This percentage depends on liquid and fat content and what temperature it’s cooked at. Generally, the leaner the cut of meat used, the less the shrinkage. During cooking, protein in the meat starts to react with reducing sugars and these break down into their composite molecules which then recombine with each other in different arrangements to cause browning on the surface of the burger. Called the Maillard Reaction after the chemist who discovered it, this reaction occurs at around 250°F. The higher the heat, the more intense the browning which then creates a more complex flavor. Unfortunately, if burgers are left on high heat for too long, they will burn so it is often recommended that you firstly grill your burgers in the hottest part of the grill to allow them to brown but then move to a cooler part to finish cooking (also known as indirect grilling). When your burgers are cooked, let them stand or rest for a while. The USDA says meat should rest for three or more minutes, but you may prefer to leave them for longer. Resting burgers allows them to finish cooking and for the juices that are on the surface of the burger to redistribute across the meat. Using a burger press is one of the easiest ways to cut down on your burger preparation time in the kitchen and offers the freedom to get creative with your burgers. A press also guarantees that your burgers cook evenly due to their uniform thickness and shape, helping reduce the risk of you or someone you know becoming ill from badly cooked burgers. 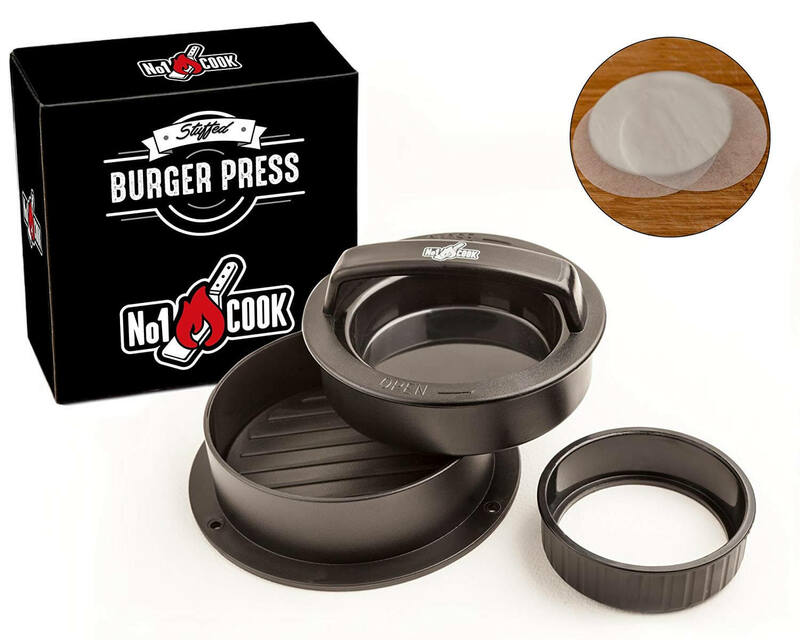 Whether you want a heavy duty burger press or one that offers the flexibility to make stuffed burgers and sliders, then we hope that this review has provided you with all the information that you need to help you to select the best burger press for you and your family.